The University of Illinois at Chicago is our city's only public research institution. Together, we can create a more sustainable laboratory environment in which to work and conduct research. Currently, UIC labs dispose 70,000 pounds of hazardous waste and consume 5 times as much energy as a typical household each year. This page will outline small techniques researchers can practice to use less energy and waste. The Mishall lab was recognized by VCAS and the CCSE at the 2017 Freezer Challenge Award Ceremony for saving over 10,000 kWh in electricty for their proper cold storage management techniques. The International Institute for Sustainable Laboratories (I2SL) has once again collaborated with My Green Lab to launch the 2019 International Laboratory Freezer Challenge. The challenge promotes sample integrity, energy efficiency, and cost reduction in laboratories. Reduced energy consumption and environmental impact of the lab. Decreased costs associated with maintaining extraneous cold storage units. Internatinoal recognition for participants at the 2019 I2SL Annual Conference in Denver, Colorado, October 20-23. Top competitors will have their picture published in a leading scientific journal. The winning lab at UIC will receive a $50 gift card for their lab. Energy efficient related prizes will also be awarded to the 2nd and 3rd place UIC labs. 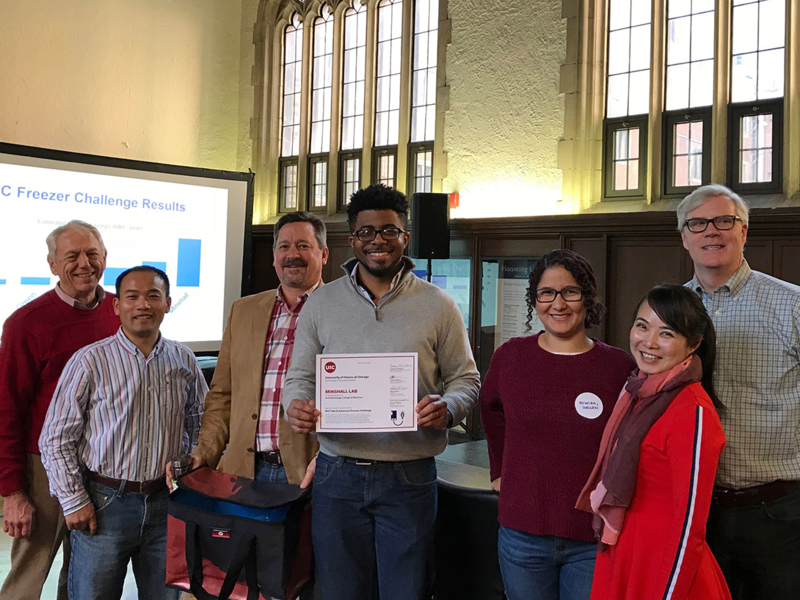 All participating UIC labs will be recognized for their efforts, much like the 2017 Freezer Challenge ceremony. Sign up for the 2019 Freezer Challenge! Laboratories consume 5 times more energy than an average home? Many laboratory equipment that are always in a “high-power” states (even when they are not needed) often draw a lot of energy. You can unplug lab equipment when not in use, defrost lab freezers, and make sure to shut the sash of the fume hood. Read the UIC Energy Policy on campus energy use at the UIC Policies website. The LabShare program accepts donations of unwanted, but usable lab supplies. We can take usable laboratory supplies such as glassware, disposable items, and equipment. Anyone from the UIC community make receive these items for professional use in their laboratory. Dispose clean, uncontaminated pipette tip boxes, lids, and refillable trays in the “Pipette Tip Box” recycling bin, located on each floor of buildings with laboratories that use pipettes. UIC cannot accept pipette tips because they have the potential to puncture and tear open the bags, but more importantly, there is no guarantee that the tips are clean. Place non-hazardous Kimberly Clark nitrile gloves in a special recycling bin in your lab and take the full recycling box to the designated nitrile glove recycling holding area in your building. the bottle is empty (nothing will drip when inverted) Do NOT allow voltile liquids to evaporate in the fume hood as a method of disposal! Never recycle a bottle that used to contain flammable*, toxic, oxidizing, explosive, radioactive, water reactive, carcinogenic, biohazardous, or corrosive substances. Please see the EHSO Lab Safety Plan how to identify a hazardous chemical and dispose of hazardous chemical bottles according to the Lab Safety Plan. *the only acceptable bottle to recycle that contained a flammable substance is ethanol. Some chemicals can be neutralized into non-hazardous components before disposal in order to eliminate unnecessary hazardous waste incineration pollution. Check the EHSO website for complete details about neutralizing chemicals. Common chemicals that can be neutralized in the lab include formaldehyde, and acids and bases, ethidium bromide alternatives are strongly encouraged as that chemical is a well-documented carcinogen and use should be avoided at all costs. At times, the University offers researchers rebates in order to purchase energy efficient lab equipment like freezers. This website will be updated as soon as the rebates become available again. I2SL works with research labs globally and has resources for a more sustainable lab.